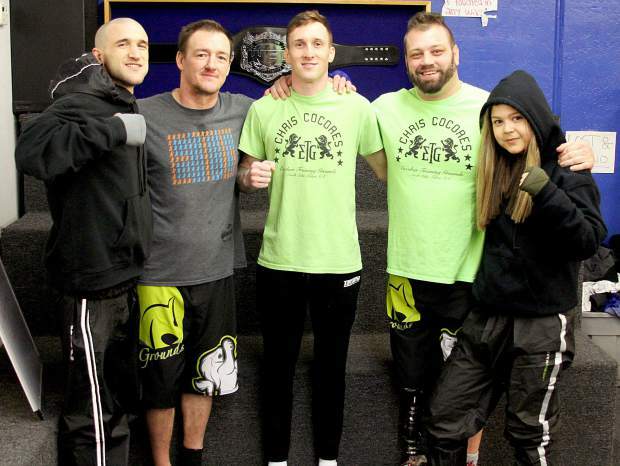 Local fighters (from left) Cameron Church, Tom Potts, Chris Cocores, Ryan Wallace and Nikki Cruz will be at WFC 84 Saturday, Feb. 24, at MontBleu Casino Resort & Spa. Five local fighters will be in the ring Saturday night, and they’ll be fighting for one of their family members as part of Team Coco. South Lake’s Cameron Church will headline WFC 84, a spot he inherited from his teammate, and “Belt Brother,” Chris Cocores, who nearly died in a Dec. 28 car crash that claimed the life of his girlfriend and dog. Church, Nikki Cruz, Ryan Wallace, Tom Potts and Chris Montenegro will donate everything they earn from their fights to Cocores to help with his massive medical bills. T-shirts featuring Team Coco will be sold at the event with all proceeds going to Cocores. Church is undefeated in 10 bouts and holds four different kickboxing championship weight belts in four divisions. He is making his Mixed Martial Arts debut. Wallace will take part in a jujitsu match and will be in the ring for the first time. He’ll do so with the help of a prosthetic leg. Wallace, who unknowingly was suffering from cancer at the time, lost his leg after breaking it while wrestling in high school. He had multiple surgeries to try and save his leg but the cancer wouldn’t let it heal. Wallace’s first prosthetic leg was basic and it didn’t take long for him to break it. He broke his good foot as well. His insurance found a way to avoid replacing his prosthetic. And while being depressed and not knowing what to do, he received a Tahoe miracle. Cruz is a 16-year-old student at South Tahoe High School and also will be getting into the ring for the first time. She first started training at Escobar Training Grounds a couple of years ago and didn’t have plans to fight. But during her time there she became everybody’s little sister — the team at Escobar’s provides a strong support network to where she feels like she will do well. She’s excited she gets to make her debut in her backyard and fight in front of her family. Potts also will make his fighting debut. The 41-year old from Woodfords, California said working out at Escobar’s, something he’s done on and off for six years, inspired him to want to fight. Potts is excited to see Cocores back at home, with his fight family. The fights will take place Saturday, Feb. 24, at MontBleu Resort Casino & Spa. Doors open at 7 p.m. and fights start at 8. Ringside tickets may be purchased for $58 with value seating at $33. Tickets can be purchased in advance at http://www.wfcfights.com or at the venue. Team Coco will be there in full force, and win or lose they will do it as a family.